»All Posts»Arsenal: A long week over and the race run …..
Arsenal: A long week over and the race run ….. I am the wrong man to provide any form of detailed match review today. “Not much difference this week then” I hear some of you say, but this week I did not seen the game live or on stream, but listed to it on the radio and followed it on Twitter. God it was hard work. I did later supplement the audio experience with the highlights on Sky and on MotD so I saw most of the good bits. And of the bad bits ? Well I heard the howls of rage and frustration via the radio. As for the main target of the ire, in the ground and on the internet, referee Tierney can never, ever have been described so frequently by the same digital descriptors in so short a period in his life. Of my impressions of the match itself ? We came into the game physically tired and it showed.Part of that fatigue was down to injuries and that we had no Ramsey and Ozil and the same layers had to turn out again for another hard working performance against game opponents. I can see, I think, why UE started with Laca and PEA up front. His aim was breaking the Terriers open early and being a goal or two ahead after which, after half time, we could control the game and ease off. We had a comfortable win against them last year and they have let in a lot of goals away from home. I could see his logic. Unfortunately when that opener did not come there was no opportunity to lower the team’s gear and I thought we were forced to work as hard against the Yorkshiremen as we had in either of our previous two contests against loftier opponents. Despite that frustration however we did keep our concentration. Our energy did not wane. With 80%+ possession we pressed until, finally, the visitors cracked and our Uruguayan dynamo flew through the air. It was a very good goal, the ball from Matteo, the take down and control of Auba and, most spectacular of all, the scissors kick from Lucas. The second positive in the game, which proved as decisive as Torreira’s winner, was the success the defence had in stopping Huddersfield scoring. It was as long ago as September since we had last had a “0” in the Premier League. Man of the Match award for the game though ? For his constant energy yesterday and on Wednesday step forward and hold out your hand Matteo Guendouzi. Of our opponents read and heard a lot of abuse about their approach to the game but what I saw they defended well, albeit stretching the rules to the limit. 12 months of PL football has made Wagner less starry-eyed I suspect. They will be disappointed that they did not have another 12 minutes in them to cling on. As last year though I fancy they will survive. So a decent interval until Southampton and every prospect of taking advantage of the chaos at St Mary’s, a tricky ground in recent years. In the interim Qarabag, and you will be pleased to hear I am in the Clock End for that one. I shall spare no gory detail. ← Arsenal Must Be Ready To Go Again. Have all dropped into the Europa League. Despite being deprived of the services of three of their standout players, Arsenal U18s still managed to make it through to the fourth round of the FA Youth Cup with a hard-fought 2-0 victory over Northampton Town tonight. 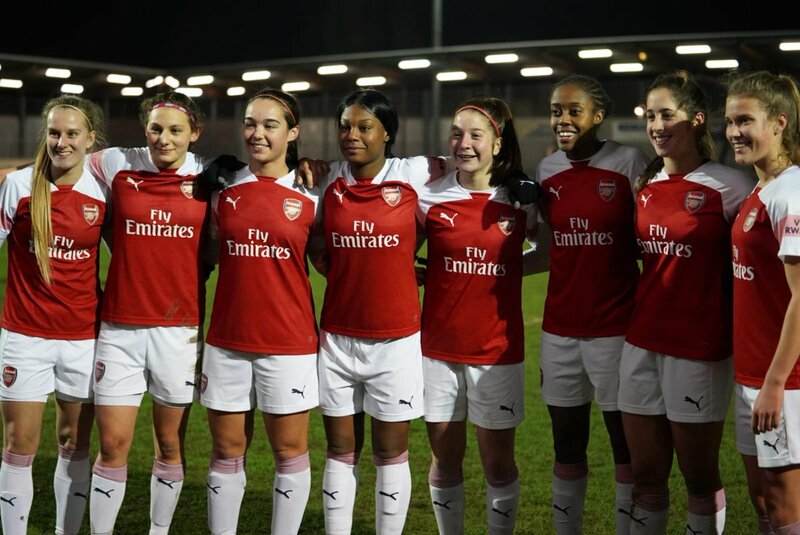 Folarin Balogun and Zak Swanson were on the scoresheet for Ken Gillard’s side, but Arsenal will know that they will face even tougher tests as the competition goes on, especially in the next round, when, intriguingly, they will take on either Millwall or Tottenham Hotspur. There were some impressive performances for Arsenal, with Matt Smith and Ben Cottrell amongst those to make a major impact. 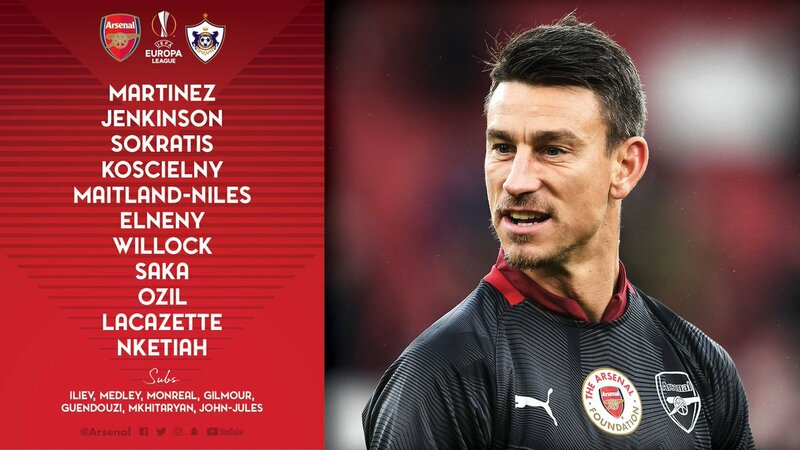 Gillard was without Tyreece John-Jules and Bukayo Saka, who are likely to be involved with the first-team against Qarabag tomorrow, while winger Xavier Amaechi remains injured. The Arsenal coach made some notable selection decisions, with Karl Hein starting ahead of Arthur Okonkwo in goal and Zak Swanson being preferred to Joel Lopez at left-back. Both of those choices were vindicated, with Hein and Swanson both performing admirably, suggesting that they are likely to retain their places for the next round. Three schoolboys – Yunus Musah, Mazeed Ogungbo and Miguel Azeez – were named on the bench, with the first two proceeding to enter the fray in the second half. Subs: Ogungbo (for Spencer-Adams), Musah (for Greenwood), Lopez (for Swanson) Not used: Okonkwo, Azeez. Arsenal started brightly with Trae Coyle’s cross finding defender Mark McGuinness, who was up from the back, but his header was off target. It quickly became apparent that this game wouldn’t be a walkover, with Northampton demonstrating excellent determination to cause numerous problems for Arsenal. Arsenal still managed to create the majority of the chances in the first half, with the lively Sam Greenwood having a shot saved by Bradley Lashley. The young Gunners twice had to be alert to cut out the danger at the back, with Vontae Daley-Campbell and Bayli Spencer-Adams making important interventions, but eventually Gillard’s team managed to take the lead. It came as little surprise that Balogun was the scorer, with the striker having been in prolific form for the U18s this season. Following a well-worked move, Balogun was on hand to slot home comfortably past Lashley. Northampton sought to get back into the game immediately and put Arsenal under intense pressure in the closing stages of the first-half, but they were unable to pull level, with Hein making an impressive save in the process. In the second half Cottrell, who has been impressive in the league this season, was starting to become increasingly influential, and the winger did well to find Balogun, who shot over on this occasion. Northampton had a couple of efforts as they looked to equalise, and Arsenal were then dealt a further blow as Spencer-Adams suffered an injury that caused him to be replaced by Ogungbo. Greenwood had a free-kick saved but that proved to be the former Sunderland attacker’s final meaningful involvement before he was replaced by the highly-rated Musah. Eventually, Arsenal effectively made sure of the victory as Swanson found the net and, although there was an element of fortune about the goal, the versatile youngster deserved to cap off an impressive display by scoring. Swanson seemingly attempted to cross the ball but it ended up looping over Lashley before going into the net. Summer signing Joel Lopez was then sent on in place of Swanson and Arsenal managed to see the game out with their two-goal lead intact despite Northampton missing an inviting opportunity to score. Overall, it wasn’t a vintage performance from Arsenal but there were plenty of encouraging signs as they look to go one better than last season, when they were thrashed in the final by Chelsea. Full-backs Daley-Campbell and Swanson were largely impressive, while the excellent Smith dictated the pattern of play with some superb passes. Greenwood, meanwhile, caught the eye in the first half before fading, and Balogun was a constant nuisance to the Northampton defence. Musah made one barnstorming run that demonstrated just why he is so highly regarded, Lopez also looked assured when he came on and Hein will be pleased to have kept a clean sheet in his first involvement in this prestigious competition. On the negative side, Trae Coyle failed to make much of an impact and there is some concern about the lack of progress made by a player who was so impressive as a schoolboy. Midfielder James Olayinka was also not at his best and is often guilty of taking too many risks in midfield. When it is considered, though, that Amaechi, Saka and John-Jules could feature later in the competition, Arsenal may well be able to enjoy a lengthy run. Andy I just noticed I’m the only one who liked your post, you are getting even more unpopular than normal. It is a talent I have Ian, and it is developing ! Seems women’s academy still one of if not the best in business then. One obstacle they face seems to be that many take college/Uni route to America. Think two promising centre backs who were in first team picture did that year or two back and now one another is doing the same- Kukyen (?). Saw a post from her proud pa when she debuted- happens to be an Oxford university professor. Can’t blame them and with a bit of luck we’re first in queue if they return here. Getting twitchy now in league, which is to be expected with small squad, two great players out and a few more big players with long term injuries. Come on then, what are thoughts on Cahill to Arsenal rumour? I’ve long been keen on a taller physical centre half idea, and he’s that. Has a brutal edge to his game, including committing fully to challenges he’s unlikely to win. I’m not sure, even aside from that, as his own current manager summed it up well by saying he is very good defending his box but a defender for Chelsea now needs to play 100-something passes per game. Similar deal with us, surely. All the same, can’t say I’m totally against the idea, though maybe in part that’s because aggression has been up against us in last three games. Be happier if diamond eyes can bring in Guendouzi type, little-known though, allowing the dream of another out-the-park signing. I dont mind if he came Rich if he can do the biz, meld with the lads. And if hes not so hot at passing, he can learn, the Big Mert became a great passer of the ball once he came to us. Think there’d be benefits with an experienced English/ British player. We have the promising youngsters, but if the Ramsey and Welbeck exits come to pass that leaves us with… only Holding, Chambers and Jenks (who’ll probably be off himself). We never got the benefits I hoped from having a decent number of brit players- Walcott, Ox, Wilshere, Gibbs, Ramsey, Welbeck, Jenks, Chambers, Holding- but I haven’t abandoned idea it should/could help a little with refs and media. I’d like us to have some older Brit pro’s to guide the young lads coming through, just on probability (of it being beneficial), but there are few realistic candidates out there. Whenever any player gets a long term injury the media goes with “so and so to replace injured __________” in reality clubs realize that when the injured player comes back your overstaffed and wasted money. Any player we get in would be someone we were looking to bring in in the summer anyway. That again would be if a player was moving out or a position had already been identified. Rich-Interesting point,personally I dont mind Brit or not, as long as they do the biz in our tough times, although Im sure you feel the same. A strong defence with some commanders is always a great thing though. Yep, ultimately just want good players and, ideally, people, and don’t think nationality has a bearing on either. Don’t like anyone more for being a Brit, nor reverse. Favourites are almost entirely about what they produce on pitch. I would ideally like a decent British element in squad, partly because most of our academy lad are brits, and I want them to come through. Aside from that, I just imagine there are some practical benefits. Just thinking of stuff like the instant, helpful rapport Guendouzi had with Auba and Lacazette and how it could be same for young English lads. Always thought Danny is prob good on that front, and Ramsey too I expect. Loved what i heard about Rosicky the other day- would coach young players in training about how to make it more difficult for him in match situations. Saka’s rise has been phenomenal and great to see him Eddie and Joe all getting a start. Great to see Medley, John-Jules and Charlie Gilmore on the bench. It would be great to see them too COYG. klick likes for all the above posts from me. All the best to young and youngers tonight, COYG! The Arsenal goalscorer, No 9… ALEX LAAAAACAZEEEETTE! hey Ed, have you seen Girouds freekick tonight? Pretty smart goal. Lacazette with our goal, its been a poor enough game of football, AFC on top, but not really going for it. Qarabag no danger as of yet. it was trending on twitter earlier. Lacazette with our goal, a dull enough game, we were in control of, Nketiah had a goal ruled out for offside, Saka grew into the game and came close to scoring late on. Koscielny got 70 minutes, Ozil got an assist, and the youths got game time. Dull, is the word I would use to describe that game. Early doors some of the youngsters were trying too hard, but mostly it was like watching a training session. Thank goodness for Ozil and Lacazette to give us one moment of quality to make the game worthwhile. Other than that it was all pretty pedestrian and dull, dull, dull! Not a thriller. Obdurate deep defence and mixed team with a lot of youngsters, sparse crowd on cold night with qualification secured. I didn’t mind it though. Picked up a bit in 2nd half, esp later on with Laca off, Eddie central. As for the bashing of Elneny…what can you say. Think for some it’s a case of however much a game falls short of hopes for it- in this case an easy thrashing- some party or parties have to be blamed a similar amount. Head honchos safe for now, youngsters not the best target…so there’s Elneny, already a running narrative in the idiot mind that he’s crap, he’ll do. Here’s Arsenal’s possible opposition for the round of 32.